The golden cake is a tradition for the Halloween. That is the tastiest cake ever. However, cutting the cake is not as simple as that. You have to cut the golden cake with the golden knife. The problem is, you can't find the golden knife. This is the thing that you have to solve right now. Thankfully, there are clues that can help you to locate the knife quickly. But on the other note, there are puzzles that you will encounter as you try to find the knife. Those puzzles are not easy to solve so you have to use your logic for those. On the good note, there are hints that can help you with those puzzles. Not only that, there are also items that you can use for your mission. You just have to think of a way on how you can use those items properly. You don't want to stave anyone so you have to find the knife as soon as possible. Everyone is waiting. You have to move as fast as you can. 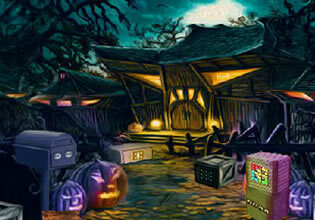 Halloween Find The Golden Knife is a brand new point n' click outdoor escape game by Top 10 New Games. Good luck and have fun!